My old home office desk was feeling too samey of late, so I replaced it. 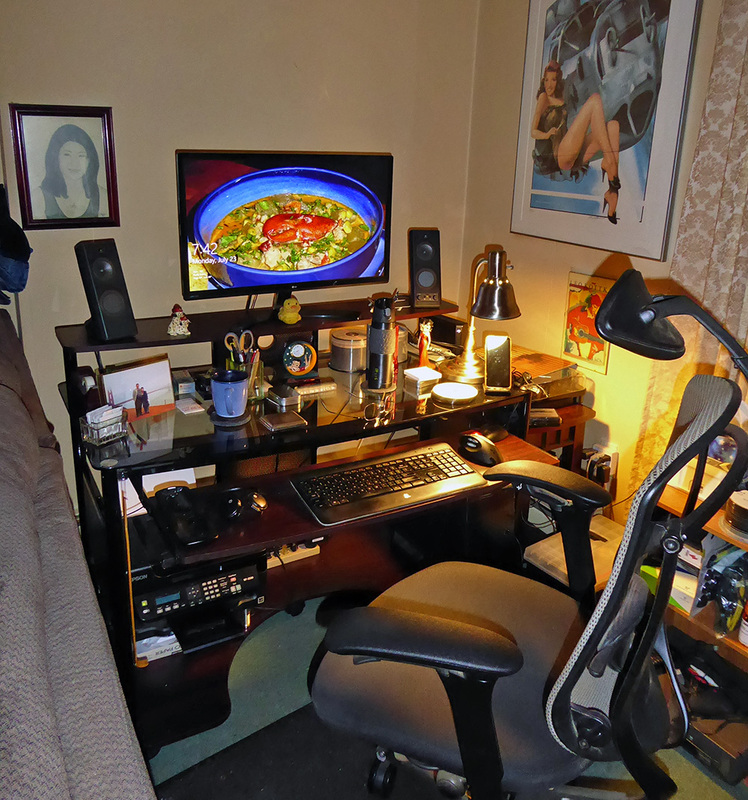 The old one was all wood – well, veneered particleboard – and similar to the new one, with the same 4×3 foot footprint along with a raised monitor shelf and pull-out keyboard tray, but the new one is a better design, with 50% more desk space, 50% more bottom shelf space, 50% more room on the keyboard tray, and maybe 200% more class. 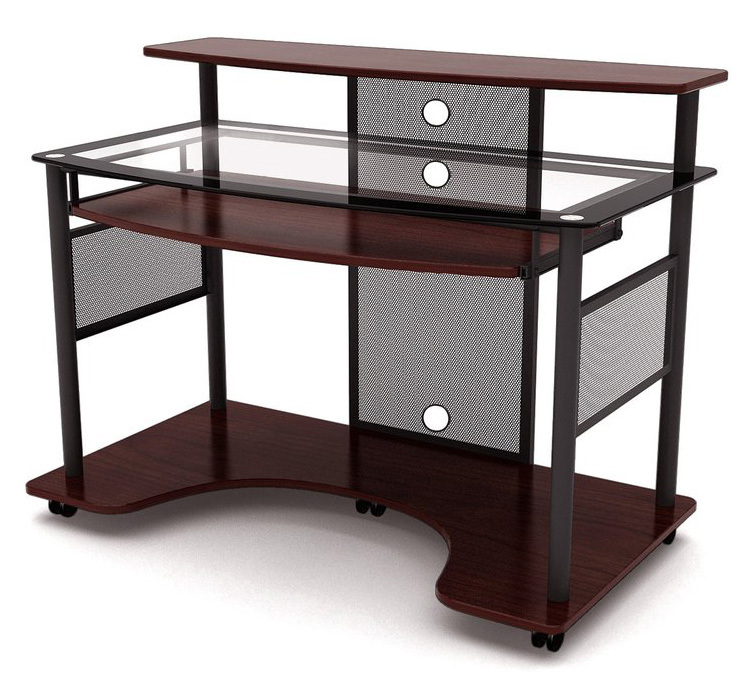 I found it via an image search for “workstation desk”, with this picture of the Cyrus desk, a metal and wood design with a heavy tempered glass desktop, on the third or fourth result page. From the look of it, I figured it would be pricey, probably between US$200 and $300, but I was pleasantly surprised to find it was just $130 on Amazon, which I believe is $40 less than I paid for that boring old workstation fifteen years ago. I assembled it in a couple hours and found it quite sturdy. I think it’s so far away from samey as to be fantastic. I said to a visiting friend the other day, “I love this desk”, not something you hear me exclaim of many inanimate objects. My printer is on a separate glass and metal stand on the bottom shelf, with paper storage underneath, and the PC, not visible at lower right, and all cables and power strips are self-contained on the desk instead of partly behind and underneath as they were before. As an example of how much more room there is on this desk, I could fit the keyboard and trackball and not much else on the keyboard tray before. On the new one, from left to right, I have a Logitech Harmony remote horizontal charging stand, a Motorola S305 Bluetooth headset, the keyboard, a Logitech trackball, and its receiver, which formerly sat on top of the PC. I added a hook on the left corner of the desk for the backscratcher and a soft rubber five-channel cable manager on the right corner to corral all the pesky USB cables. The 8″ long metal USB 3.0 hub with 7 ports and 3 charging ports that also used to be on top of the PC is now at the rear corner of the desk instead. The old desk was perfectly usable, so I put it outside festooned with large “FREE” signs visible from the street. It took eight days, but someone finally got themselves a good desk and, on a less magnanimous note, I didn’t have to dismantle it to put in the dumpster.